Posted by RDN under Uncategorized on 10 March 2019. No comments. What kind of public performance should I try to deliver? I used to do quite big presentations for industry, schools, universities and NGOs. I appeared once at the Hay Literary Festival and once at Glastonbury (until I was run out of the latter by grunge eco-freaks). These events were highly argumentative, and entertaining for at least some in the audience, which I very seldom appeased. Now, I want to face different challenges in a quite different spirit. Posted by RDN under On movies / Politics & campaigns on 11 February 2019. No comments. "The Wife", enjoyable and in places subtle and supple as it is, remains open to the charge that its basic premise and plot does no favours to feminism. Posted by RDN under On art on 23 January 2019. No comments. 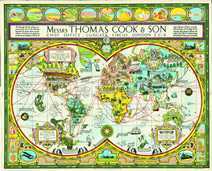 In 1924, Stanley Kennedy North drew two maps, one for the Thomas Cook tourist business and the other a London transport map for the 1924 British Empire Exhibition (the one featured in The King's Speech). Posted by RDN under On movies / Politics & campaigns on 19 January 2019. No comments. It is possible that my title is one tad too strong, if nicely economical. At more and milder length I would say The Favourite is disobliging to women and in particular to the interesting women it purports to portray. Posted by RDN under Mind & body / On books on 1 March 2018. No comments. This is a premature account of my attempts to discover and understand Edith Stein. It includes (listed below) what I hope are fruitful leads (those I intend to follow-up myself). It is impertinent of me to write this without (at the very least) having bought and read the philosopher Alasdair MacIntyre's short intellectual biography of the saint and philosopher, not least because his journey to and within Catholicism parallels Stein's. What's more, I have only glanced at her most obviously pertinent philosophical book, The Problem of Empathy, and know even less of her spiritual and theological writing. However, writing these preparatory words cleared my head, and they may be useful to other newcomers to this martyr, hero and thinker – and the culture of her world. Posted by RDN under Mind & body on 1 March 2018. No comments. A recent, wet, windy winter day in the city of Valencia confirmed and more the wonderful experience we had one September day a few years back. Here are my Top Five attractions, in the order I would prioritise for a fleeting visitor who wanted the very special nature of the city. Posted by RDN under Mind & body / On movies / Politics & campaigns on 26 January 2018. No comments. The latest Darkest Hour movie is enjoyable and has high production values. It is, as lots of people say, rather a good flipside to the blockbuster Dunkirk. But whilst Dunkirk had merely a few absurdities amongst its conceits, Darkest Hour is, I declare, positively unethical in important parts of its story-telling. Posted by RDN under Mind & body / On TV & Radio on 29 December 2017. No comments. I have made one rather feeble and unuccessful attempt to "sell" these ideas for TV shows. I would like to present, write, mentor or research any of them. But I don't really mind. It would be nice to see them on-air, whoever and however it happens. Posted by RDN under Mind & body on 27 December 2017. 2 comments. This piece argues that we do not have much empathy, and that even if we had more it would still be a very imperfect engine of moral or ethical behaviour. Posted by RDN under Mind & body / Politics & campaigns / RDN's media outings on 14 December 2017. No comments. I had a lively outing on BBC Radio Scotland's morning phone-in on the ASA/CAP's crackdown on gender stereotyping. Without much thinking about the Quangos' specific motives and proposals (I will maybe devote time to that exercise) I said quite boldly that whatever stereotypes advertisers promoted, I had never seen any that were more harmful than the culture-crimping, the dreary campaignitis – and, yes the PC Gone Mad element – of the Bossy Liberals who want to censor them.